We are excited to announce that Heather Hiles, Deputy Director of Postsecondary Success at the Bill & Melinda Gates Foundation will deliver the Keynote address for Day 1 at the Saylor Higher Education Summit taking place this June 21st and June 22nd in Washington D.C.
Heather is a visionary and leader in the higher education space. Before joining the Gates Foundation, Heather founded and served as CEO of Pathbrite, an innovative Portfolio Learning Platform. Before Pathbrite, Heather served as a founder or leader of several private and public sector organizations, including: Commissioner for the San Francisco Unified School District; Executive Director of Silicon Valley Social Venture Fund (SV2); co-founder of EARN; and CEO of SFWorks, a nonprofit that helps women transition from welfare into careers. Heather received her B.A. from University of California at Berkeley in Economic Development and Ethnic Studies and holds an MBA from Yale University, with a concentration in Finance and Strategic Planning. She has served on the boards of Leadership Public Schools, Alonzo King Lines Ballet, AIDS Legal Referral Panel, and Communities United Against Violence (CUAV). 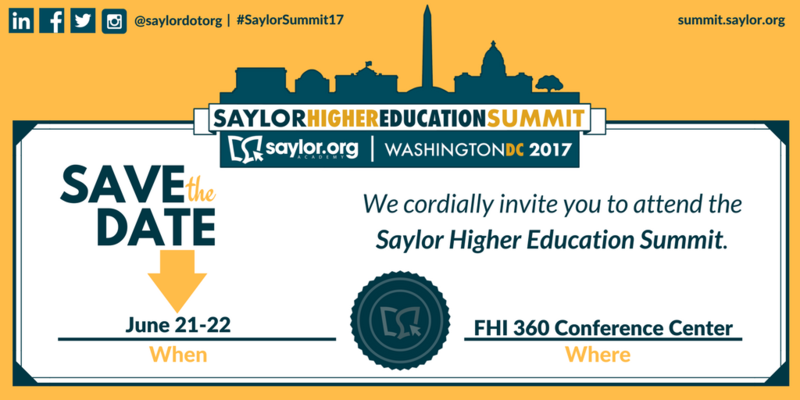 The Saylor Higher Education Summit will take place at the FHI 360 Conference Center in Washington DC, June 21-22, 2017. Registration and presentation proposal information can be found at summit.saylor.org.